This tutorial builds upon the Email Marketing with Podio and ConvertKit: The Basic Process tutorial that I recently posted. That tutorial convered the basic setup of Podio, Zapier and ConvertKit to get a basic process for adding new subscribers to an email sequence. While it is great to have a process that automatically adds a lead to a specific sequence, it is even better to be able to select from a list of sequences. Each lead is different, and should be assigned to an email sequence that better aligns with their needs. Here is a demonstration of what the final process will look like. Before you get started with this tutorial there are a few things you will need if you don’t have them already. This is a little redundant for those coming from my previous tutorial, but just in case you found this post first I wanted to include this. You probably already have one of these accounts if you are on my website, but just in case you can signup for one at the link below. Unfortunately Podio has recently adjusted their free accounts to 500 records or less. You can start out there but I’m certain you will need to get a paid account down the road. This is the email marketing service that will be sending the email sequences to the leads. The service will cost you about $29/mo which is well worth it. This is what allows Podio to communicate and pass information onto ConvertKit and Podio. Zapier has different pay tiers for account types, and for this tutorial you’ll need to signup for the Starter Account. Sign up is free and gets you into the free trial of their premium features. Once signed up you’ll then have the option to upgrade to one of their Paid Accounts. Again the Starter is fine here. This tutorial builds upon a previous post that I published a about a week ago. You won’t technically need to have finished it to implement the ideas in the post. However if you are new to Zapier and ConvertKit it will help your learning curve greatly. In the previous tutorial this field was created with only the Podio – New Lead option. Now we are going to be updating this option with the tag id as well as adding 2 more options with their tag ids. This field will list the Tags (and their Ids). These tags will link to the corresponding mailing sequence you want to assign a lead to. Each category option will have 2 bits of info (1) the Tag Name and (2) the Tag’s Id. The tag name is easy to get, however the Tag Id takes a little bit of digging. No worries though, I’ll show you exactly how to get it. Go to your ConvertKit Dashboard (click on subscribers if not already there. Hover your mouse over the tag you want the ID for. This field is going to be used to record the creation of the subscriber as well as which email sequences it has been added to. In the future this log will be used even more to record things such as unsubscribes and perhaps when emails are being sent. Automation – This will assign the subscriber to the correct sequence based on the tag that is applied. Rules – These will remove a subscriber from a sequence when a tag is removed from a subscriber. There is nothing complicated here, we are building off what we setup in the previous tutorial. So it is just duplicated what we already have 2 times and then making a tweak. The only part that isn’t quick or fun is coming up with the wording in the new emails. In this tutorial we are going to have 3 email sequences that we can assign to a lead/subscriber. You can add as many as you like, you will just have to duplicate the steps for each sequence. Here are the 3 email sequence we will end up with. 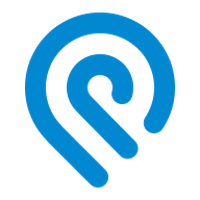 Podio – New Lead. This is the sequence we already have from the previous tutorial. It’s designed to send out to new leads that are motivated and looking to get an offer on their house. 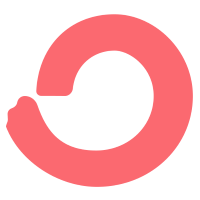 Podio – Sell House Quickly Info. This sequence is designed to be sent out to those prospects that kinda motivated but are kicking the tires. We want to send them information about selling quickly and the best ways to do it. How does a cash home purchase work? Podio – Not Motivated. We want to use this sequence when we get someone who is not motivated at all just yet. Say they have 6 months or a year before they have to sell. These emails will be designed to help them with ways they can sell their house. Next thing we need to add are the 2 tags for the new sequences. Here are the steps to add the new tags. Nothing special here, just go to the Subscribers dashboard, scroll down till you see the tag area. These are simple two step automations that are triggered when you add one of the above tags to a subscriber. When setup correctly, they will look exactly like the image below. Action Step: Add subscriber to Sell House Quickly Info Email Sequence. These rules are for removing a subscriber from an email sequence. They are triggered by the removal of a corresponding tag from that subscriber. Rules are the older version of Convert Kit’s Visual Automations that we used in the previous step. However we must use them because the feature we need doesn’t exist for visual automations just yet. In the prior tutorial, the Zapier Zap that we create was fairly straight forward. This Zap however is going to be more complicated. The main culprit is the use of some Zapier Code Action steps that we must take advantage of. We will be using those to access the ConvertKit API to add and delete the appropriate tags. We will need to create 2 Zaps for this process, (1) for when a new lead is created in Podio and (2) for when we update the selected sequence. 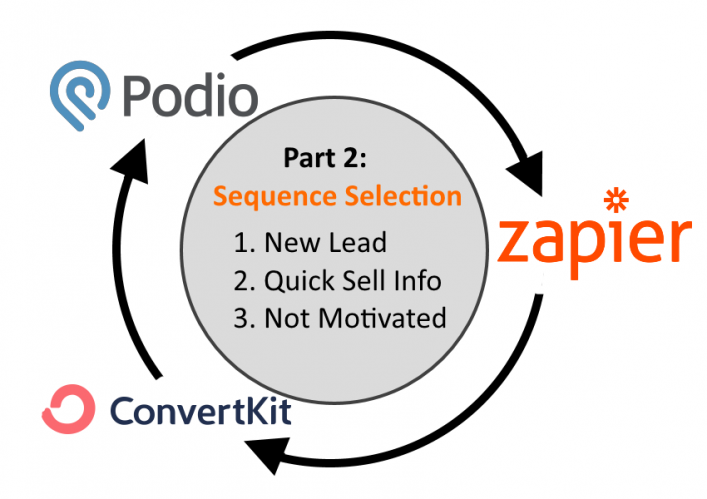 We want this Zap to run when a new item gets added to your Podio leads app. In this step we will do the following. The first thing the process will do is add a new subscriber to your ConvertKit form. This step simply creates a date variable that is formatted to YYYY-MM-DD HH:mm:ss am/pm. We will use this in the Podio Log field we created as a way of time stamping when an action occurred. The value of the Choose Email Sequence field will come into Zapier as something like Not Motivate – 783183. What we need to do is strip out the Tag id (ie 783183) from that value. We can only add tags once a subscriber has been created. We will use a ConvertKit Action here to simply add the tag to the subscriber. Lastly we need to update the Podio App Item that triggered this process. We will but sending back the ConvertKit subscriber id as well as the entries for the Log. The only things left to do is give this Zap a name and to turn it on. I’m going to name mine Add Subscriber and Tag. Hopefully you didn’t have any trouble with this tutorial, if so please feel free to email me at scott@strugglinginvestor.com or post a comment below. This Zap will be used to update or change the email sequence for a lead/subscriber. It is triggered on the change of the Choose Email Sequence Podio field value. When that happens the subscriber’s currently assigned sequence will be ended and they will be added to the new sequence. Note: Once a subscriber’s sequence has been changed, it can not be changed back. ConvertKit does not allow for restarting of a sequence once unsubscribed from it. We want this Zap to run when an existing Podio item is updated by changing the value of the Choose Email Sequence field. We do not want this Zap to run for every type of update, just this one field. The first step in changing a tag is to remove the existing one. We could do a blanket “remove all” type command, but we might remove a tag placed for another reason. So we are going to hard code in 3 commands to remove only the 3 Email Sequence tags that we created (New Lead, Not Motivated and Sell House Quickly Info). The only things left to do is give this Zap a name and to turn it on. I’m going to name mine Update Subscriber Tag. Hopefully you didn’t have any trouble with this tutorial, if so please feel free to email me at scott@strugglinginvestor.com or post a comment below. If you have implemented this tutorial as an add on to the previous one, you now have a pretty solid integration between Podio and ConvertKit. You’ll be able to pull in a lead and select which email sequence that will go out. You will also be able to update the email sequence in the future. The only major thing missing is the ability to see if a recipient decides to stop receiving these emails (opts out). This is a fairly easy addition by creating a zap. This is an updated version of the tutorial. My original process allowed you to assign multiple email sequences at once. In order to make it work I used a calculation field in Podio to store the selections, which were then passed onto Zapier. This calculation field was needed because Zapier will only ever pull in the first value in a multi-select Podio category field. VERY FRUSTRATING! So i needed a work around. The issue with the calculation field, where I put the Sequence Selections into a comma separated string (ie: 8484733,2029282,0292929), is that it does not get calculated fast enough by Podio. Sometimes this caused the Zap to run before the calculation happened. Meaning the Zap does not get the Tag Ids and thus doesn’t add the tags to the new subscriber. BUMMER!